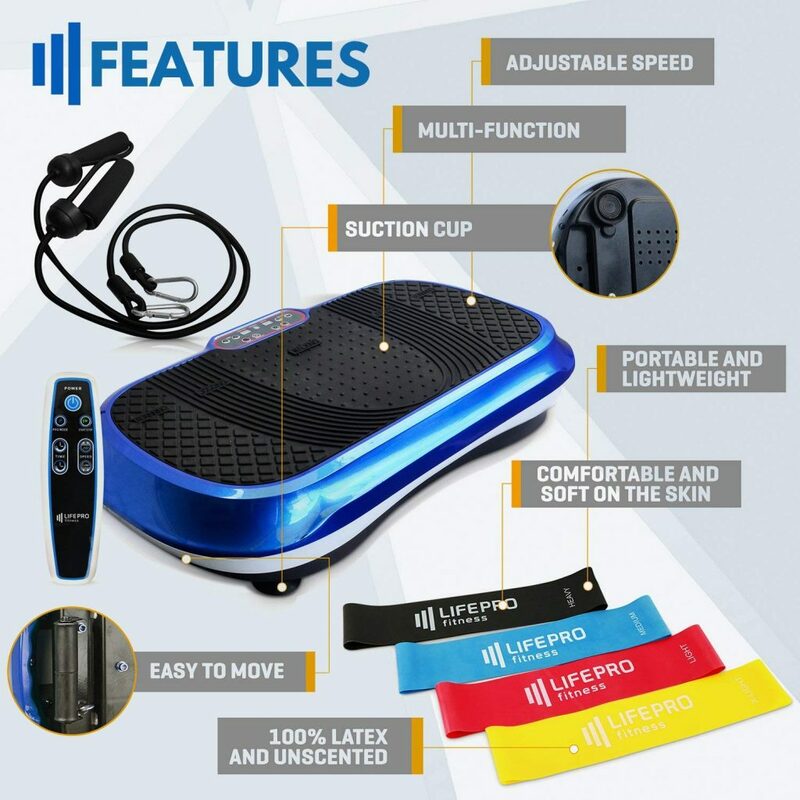 LifePro Waver Power Plate is a home vibration platform with loop bands for a whole body workout to lose weight and fat, and tone up. It is rated 4.8 out of 5 stars by 90 customers at Amazon.com, which is a rather high satisfaction score. You can purchase it in either blue or white from different sellers. It is designed to help you enhance your flexibility, fitness and strengthen your muscles and have a leaner body. 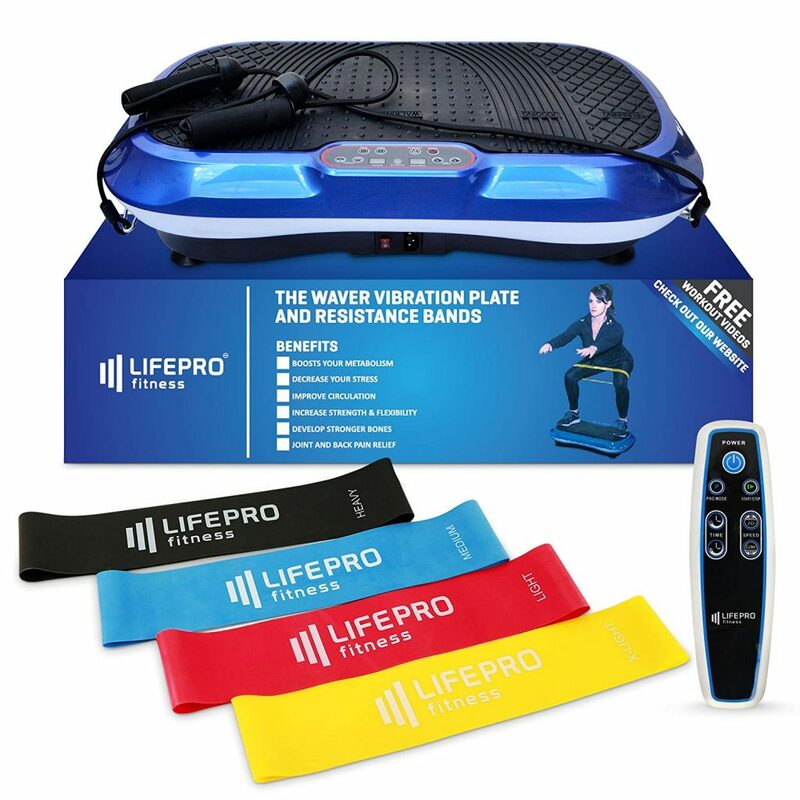 The way the LifePro Waver works is it vibrates your whole body and causes more muscle contraction and stimulates your muscles, whether you’re a beginner, intermediate or advanced trainer. It will increase your metabolic rate, enhance blood circulation, help burn fat and calories, strengthen, tone and build muscles in your upper and lower body with the resistance bands provided, increase bone density, suppress joint stress, and decrease cellulite. It offers a great low impact way of working your muscles without any burden on your joints or ligaments. The LCD display panel is user friendly and easy to read and operate, with the remote control provided. You can adjust the speed between 1 and 99 and you can start at lower levels and move up gradually to what your body can handle. The LifePro Waver can go all the way down to the 4 Hertz frequencies, that make it great for lymphatic drainage. And the highest frequency setting is 12 Hertz. This solid, stable and durable vibration plate weighs 33.5 pounds and measures 30 x 17 x 5 inches. The maximum user weight is around 330 pounds, but best not to go over 300 pounds. You’ll see 120 kg or 265 pounds on the user manual as it was put on there to be on the safe side. It has the built-in transport wheels that will help you maneuver this vibration plate easily and effortlessly for storage. It is the oscillation vibration type (not linear) platform that is more useful for fat and weight loss and better for your joints. A couple of suspicious customers were surprised to find out they got results faster on this one than walking or working out. Even if you get massages from a pro regularly, you’ll see what difference this vibration plate will make as you feel the loosening all over your body. When you stand up on this, your lower back and hips will feel significantly better if you’re sitting in front of the computer all day. And you shall get different good results with different poses and movements. This shouldn’t replace your conventional workout program and eating well regularly but would make a great addition. It is a plug and play type unit that doesn’t require any assembly either. It is easy on the eyes, feels sturdy and durable, is easy and fun to use, will give you results over regular daily use and eating healthy, does not take up much space, and the price tag seems right. The company stands behind their products and this LifePro Waver is offered with a warranty of lifetime. They tested and proved their products both for durability and comfort. You are welcome to try the power plate risk-free as it is offered with hundred percent satisfaction guarantee. You’ll get a free online pro trainer manual, an ebook and free workout videos with the instructions.